LED Open Signs - Business Open LED Signs - Free Shipping! Your customers will never have to wonder if you�re OPEN for business with one of these luminous LED Open Signs. Dazzling lights and fun cursive lettering is eye-grabbing. This is affordable advertising that will immediately have an impact on your business. Hang one in bay windows, over the counter or in the doorway. Four exceptional choices suitable for any type of business. Red and blue are power colors made to get noticed. 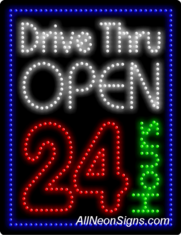 With an LED �Open� Sign � there will be no mistaking if you�re OPEN! Click for Business LED Open Signs or Open Signs sort by price.